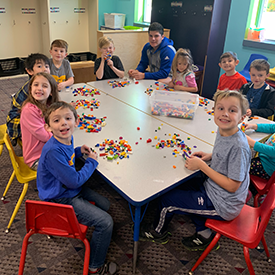 The After-School Care Program at The J provides a group experience with fun, recreational and skill-building activities for Kindergarten through 5th graders at the end of the school day. Participants will have snack and time to complete homework as well as games, active play, swimming, and art projects relating to Jewish holidays and traditions. Features: home environment, snacks, enrichment activities, arts + crafts, outdoor fun, and weekly swimming! Included with your After-School Program fees! The After-School Program has arranged transportation from specific schools via 10/10 Taxi (The Transportation Group). The drivers are trained and experienced in transporting young children and they have been screened to work with our youth. Booster seats or car seats are provided by the cab company. The After-School staff facilitates the communication between 10/10 Taxi, the parents, and the school. Parents and children have the opportunity to meet their driver before service begins. No school? Check out our Vacation Days programs during school breaks, conferences and teacher in-services. After-School Program participants receive a $5 per day discount on Vacation Days. Snow Day? The After-School Program offers a Snow Vacation Day when area schools are closed when it is possible to have staff travel to The J. When schools are canceled due to bad weather, check The J website for specific hours. Additional information can be found here. Group Child Care Program: The After-School Program is a group child care program. If a child needs assistance to successfully function in a group, prior to registering, contact DD Gass at 913-327-8079 or debrag@thejkc.org. Questions? Comments? Contact Barry Birkmeyer at (913) 327.8098 or by e-mail. For families needing financial assistance, there are limited funds available. Please contact Leslie Bitterman at (913) 981.8878 or financialaid@thejkc.org for more information.